Long before the Leaf — back in 1973 to be precise — Nissan had already been messing around with electric cars for decades. 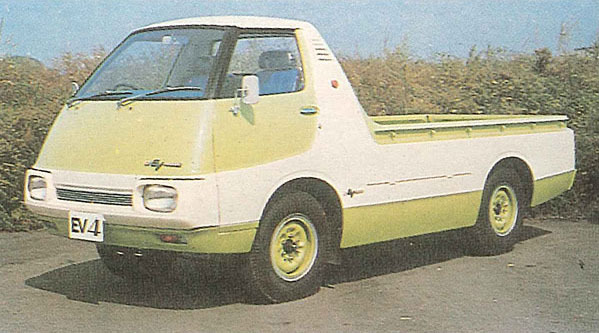 However, while the prevailing idea of an electric car was an office chair-sized bubble on wheels, Nissan built a space-tastic electric pickup truck. In fact, it built two. 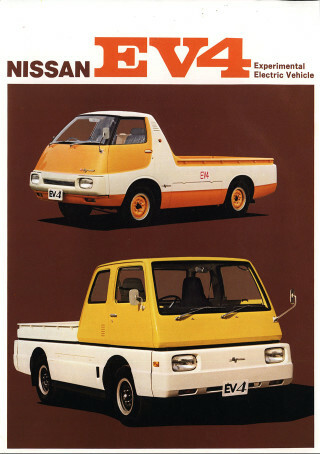 Nissan’s earliest electric cars date back even earlier, but he first of the EV pickups to be developed was the 1973 Nissan EV4-P. It ran on a bank of lead-acid batteries stored in a compartment between the front and rear axles beneath the bed. The power output was 27 kilowatts (a Nissan Leaf’s is 80 kW) and it wasn’t fast, but it could go an impressive 302 kilometers (188 miles) on one charge. The second truck, the EV4-H, built upon the lessons learned from the EV4-P and employed a hybrid drivetrain. In this case, hybrid meant simply two types of batteries — high-output lead-acid batteries and high-energy-density zinc-air batteries — and a control system that optimized the balance between the two in a variety of driving conditions. With the hybrid system, the EV4-P clocked an impressive range of 496 kilometers (308 miles) on a single charge. Both had advanced aluminum and FRP unibodies, which allowed payloads of up to 1,000 kilograms (2,200 pounds). The stuff bolted to the undercarriage was par for the times: of drum brakes, leaf spring rear suspensions, and a torsion bar and coil spring combo up front. Nissan even went as far as crash testing one EV4-P, which indicates there was at least some consideration for unleashing it on the streets. Sadly, it wasn’t meant to be. Top speed was only 54 mph for the EV4-P and 56 mph for the EV4-H, so they wouldn’t have been exactly practical in driving conditions that involved highways. They were likely prohibitively expensive to mass produce as well. Even if the time wasn’t right for an electric truck, though, the shuttlecraft design of the EV4-P would’ve been pretty rad on a production pickup. If you want to geek out over the trucks’ details, someone at the Nissan Diesel forum has found an English language brochure and transcribed it. Happy Earth Day from JNC. tagged: concept, Earth Day, EV4, nissan, trucks. I’m a fan of electric vehicles in general but it’s the styling that makes this one. Wonder if people would have considered it ugly back in the day, as they do now with the Leaf, or whether it could have set a new trend had it made it to production? I agree, sir. And, I have no doubt that there were those who loosely threw around such a ridiculously subjective term as “ugly” way back to the caveman days. It makes my skin crawl to see that word used anywhere near a vehicle story. It’s like saying, “This is perfect weather”; there literally is no “perfect” weather just like there are no “ugly” vehicles. One person’s ugly, or beautiful, or perfect, is quite different from someone else’s definition of the term. Sorry, what was the question again?.. (crickets)..
Yeah, I’m not a fan of the term “ugly” being applied to cars. I’d not call the Leaf a particularly attractive car, but I’d not echo the sentiments of those who consider it ugly. And I genuinely can’t understand people who don’t simply become accustomed to things – the amount of people who still make “urgh!” noises about say, the Nissan Juke, five years after launch like they still have the capacity to be shocked by it. Even “ugly” things fade into the background after a while, and it suggests some crossed wires somewhere to be in a constant state of repulsion from something. How about this from 25 years earlier? Got ya covered there, but you’re right, I should make reference of it in the article. Would look right at home in the TV show “Space 1999” !! The big question: is either one of those trucks in the Zama Warehouses? The nose and cab on the EV4-P are awesome! It looks like it rolled out of a Syd Mead illustration! 1000 kg, all those batteries and 496 km of range…so WTF? The new electric car are more heavy and less range, it’s so much difficult today with all the crash test requirement or less resourcefull the engineers? There are a few missing components there, partly missed in this article, partly missed in the brochure from which the information stems, and partly a misinterpretation of one of the figures on your part. The first factor is the speed at which that range is calculated: only 40km/h (24.8mph) for the truck that goes 496km (308 miles). If you drove a Leaf at a constant 25mph you’d almost certainly go further than the 100-odd miles claimed of it. It’s worth noting that neither truck is even remotely brisk either – building a car that does its 100-odd miles with a decent top speed is undoubtedly a little more difficult. The second factor is the storage capacity of the batteries, which isn’t listed. The zinc-air battery is quoted as being 110 watt-hours per kilogram, but nowhere does it list the weight, so we can’t calculate the kWh equivalent (a Leaf is about 30kWh, a Tesla Model S P90D is 90kWh and – surprise surprise, goes about three times as far as a Leaf). I’d expect the batteries in these trucks to be quite large for that sort of range because… well, they’re trucks and those cutaways show quite a bit of space occupied by batteries. The misunderstanding on your part is that the trucks don’t way 1000kg, they have a 1000kg payload – the weight they can carry. I’d not be surprised if the trucks themselves are double that weight. The EV4-H bears a superficial resemblance to the Corvair”Corvan pickup”. It would look good with a camper!